Would recommend this set. The set is a great size and looks good on the table. I just adore these S & P shakers. they remind me of spending time every summer with my gramma and grampa, and that's been a long time ago. keep up the good work!! reminds me of a simpler time. ones I currently use next to the stove. Now I don't have to refill these quite as often. I use this product in my kitchen. Love the color and they show how much is in the shaker. I would buy this product again. These shakers are a big size. Love the green color. Go with my kitchen well. These are very large and handsome shakers. The light green color is exactly like the old style depression glass, and they look great on my dining room table. I love these! My favorite color is green and these just fit my taste to tea. Green & nostalgic !!!! I love these. My kitchen is green now so these will go well with the décor. 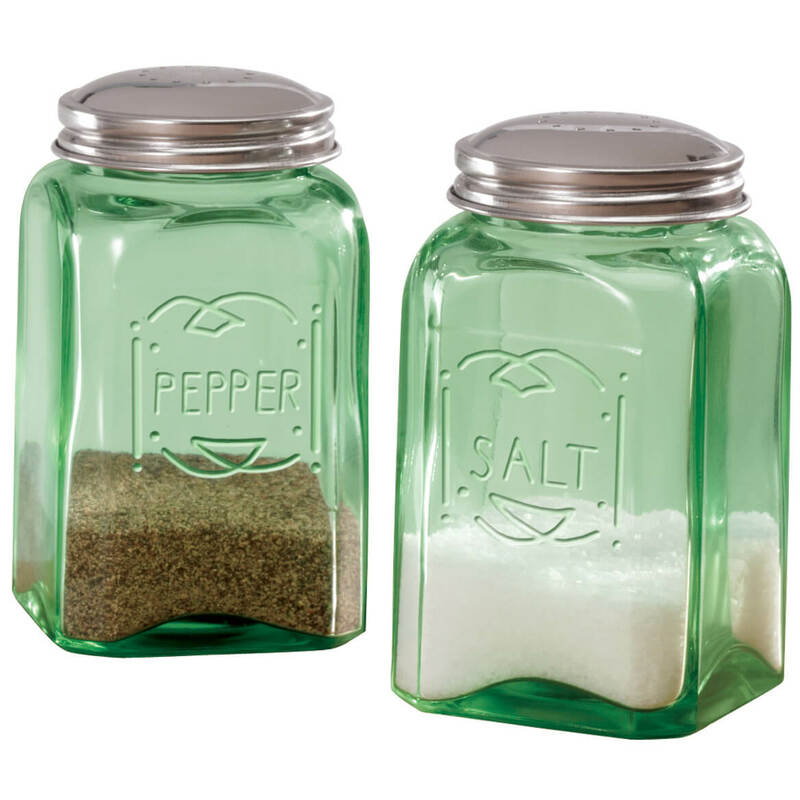 The shakers are large and will hold a lot of salt and pepper. I've been looking for a long time for the salt and pepper shakers that I love. Everyday use at the kitchen table and while cooking. Beautiful salt and pepper shakers! This will be great for everyday use. Please consider making some coffee mugs/cups like the old Fireking Jadeite. I would be very interested in them as I would use them. Thanks! These are great. They are quite large and are a beautiful lite green color. They are not that heavy being glass even with S. and or P. in them. I like the durability of them. Will not chip easy and it goes with my depression green table setting. The holes on the lids are perfect size for both salt and pepper. These go with candlesticks that were my grandmothers for my green kitchen. It is great looks very antique and matches the butter dish, Looks just like what my grandmother used to have. Larger than I thought and very pretty. I was really expecting the light green color in the picture but they are very dark green. A little disappointed about that. love the salt and pepper shakers I love Antiques the only thing the lids, I had trouble getting them on, didn't seem to be right. Great conversation Starter, secure screw on tops. It is a gift for my sister who has green depression dishes. This is great product for the price. I was surprised at the size of the shakers - much bigger than I expected. The only bad thing I can say about them is that the holes in the top of the pepper shaker need to be a bit bigger. Larger grains of pepper won't got through the holes. My husband fixed this by enlarging three of the holes. 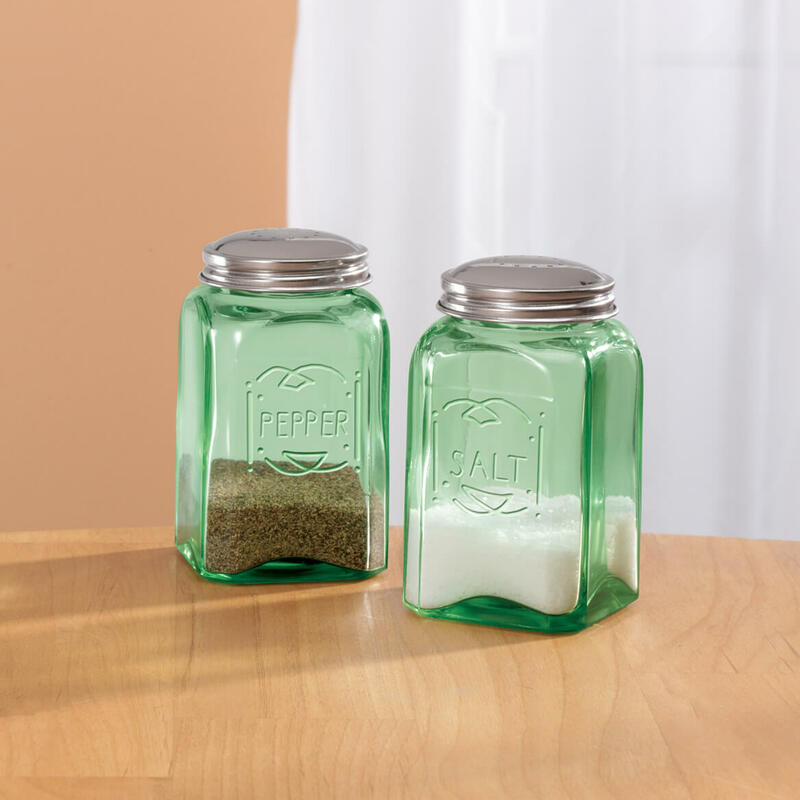 I like the transparent glass and the green color compliments my kitchen. These were very large, borderline gaudy. I don't care for the shade of green that was used. It was too bright. I bought three depression glass Salt & Pepper shakers sets to use as gifts. I purchased three sets in the past, 1 green, 2 blue, all three were perfect. The blue ones were beautiful, the green one was perfect. This time I purchased 1 blue, 1 red and 1 green as gifts. The blue and red were perfect, but the green design was not up to the standard I expect from Miles Kimball. I thought by the picture, that I was getting a light green set of shakers. Instead they are a very dark emerald green that does not go with anything in my kitchen. I was very disappointed. collect it and needed new ones. This item is very difficult to find, but as soon as I had made the decision to purchase this I knew exactly what store I would look for them first.. Miles Kimball. Thanks! JUST PERFECT FOR THE COLOR I NEEDED. My aunt has a set like this that is actually vintage. I love them and the size is great. I collect green depression glass and these will go wonderfully with all the pieces I already have. I ordered one it came in clear from another company so I wanted in green I can always depend on a reliable company!!! I bought these to root plants in -- and because I like them!!! Someday, I'll probably buy more and use that set for salt & pepper - LOL!!!! In all seriousness, I love this product! Because they open and can be filled from the top. My daughter is building her first home and I thought she would like them for her first home. Like the style and color. Hard to find good ones in store that work the way I want them to. Now I have butter dish, salt & pepper shaker, biscuit jar and plater. Love old time things. I wanted a set of green salt & pepper shakers to match my dishes. I have the salt cellar in the same green depression style glass and I like it so much that I decided to add the salt and pepper shakers. I need new shakers and I like this design. I prefer the antique yellow but it is not in stock. and why cant i search for a specific item? Do these still come in the red and blue colors ? BEST ANSWER: Thank you for your question. Unfortunately no it does not come in blue or red. We hope this information will be of help to you.